A recent call to send “peace keepers” to Syria has once again confused police with soldiers in the public’s mind. The problem has become even more acute in Canada, with its many refugees and high ethnic diversity. Many of the new immigrants come from countries where there is little difference between the functions of police and the military. This is made even more difficult by some agencies permitting officers to wear military looking exterior armour. Policing in a democratic country depends on understanding the differences between policing and soldiering. Police officers and soldiers have different duties and both must understand when the other should take over. This principle of police and military being willing to relinquish control – and take it back – is what makes a stable and safe democratic society. During the 1990s Canada started placing police in active war zones. These officers were confronted with a function they were not trained to handle, causing trauma and stressors they had not anticipated when volunteering. On the other side of the coin, Canada’s over emphasis on placing soldiers on the “peace keeper” pedestal has obscured the purpose of the military. This not only confuses but also heaps far too much stress on the individual soldier and their otherwise straightforward function. Its genesis was the “Korean conflict,” when the United Nations halted the invasion of South Korea by sending in soldiers from around the world to perform what was termed “a policing action.” In the 1957 Suez crisis Canadian soldiers were once again sent in to Egypt in what was termed “a peace keeping” role. Others quickly followed – Cyprus, Bosnia and Afghanistan. We must get back to basics and understand that there is little virtue in confusing the police and military role. If there is no difference, as some suggest, why are they separate entities? Would it not be far more convenient, and fiscally responsible, to simply let police handle the military function during civil disobedience? Major events over the past century have affected and afflicted both the Canadian military and civilian police. Canadian policing took an abrupt turn just after the First World War, when de-mobbed but still military trained former soldiers backfilled the ranks of police forces across the country. This was reinforced after World War Two when huge numbers of former soldiers filled most civil service jobs. Over the years Canada de-militarized dramatically while the US increased its military prowess through a mandatory draft during the 1950s and ‘60s. It still has a hybrid of this same system but rooted in the state administered national guard. As a result almost all US police agencies have military discipline, structures and outlook and officers are comfortable with this command and control style. All this is firmly reinforced by the Second Amendment, which encourages a firearms culture as a right. The opposite scenario exists here. 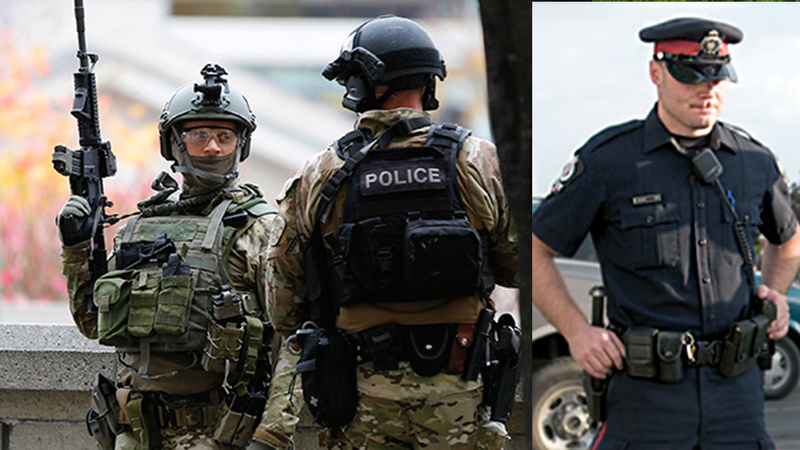 Almost all Canadian police officers are trained from the ground up to a civilian policing style. They are taught the rudiments of military discipline but command and control is seen as subservient to individual initiative. I’ll let you judge which system is better. One of the fundamentals of modern policing, based on Peel’s principles, is that a military organization should not conduct police work. Police officers are to be selected from the general population because they best understand the populace and day-to-day functioning of the society they watch over. It is this intimate knowledge that helps them prevent crime and keep the peace. Police use force as a last resort – the vast majority of arrests an officer makes involve no resistance whatsoever. The organized use of force, and threats of it, is the primary (although far from singular) function of the military, and when called upon is either practiced or implemented daily. The future of a well managed country rests in the hands of both police and the military – and the ability of police officers and soldiers to understand their appropriate roles. There’s no better example than Haiti. UN police officers made efforts to restore order and the rule of law. Once it was recognized they could not accomplish this goal, a UN military force stepped in to restore that order. Once it was re-established, the military bowed out gracefully and police resumed their work. Restoring peace is a military function requiring discipline, command and control. Keeping the peace is a police role requiring the daily display of individual initiative to people on a one-on-one basis. It should not be rocket science, but too many people do not understand the difference.